The Locket Saga began with When God Turned His Head where long ago, Kanter Thorton gave Drusilla a locket to symbolize his love for her. 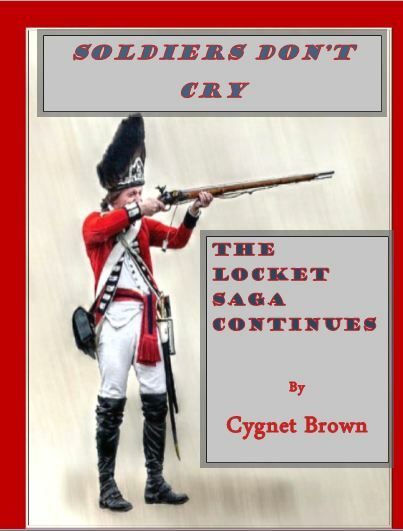 In Soldiers Don't Cry, The Locket Saga Continues their daughter Elizabeth ﻿treasures the locket. Despite Elizabeth’s patriotic loyalties, she falls in love with a British officer. As young children, Elizabeth Thorton and Philip Randolph met in the frontier of Western Pennsylvania in 1763. For years, the Atlantic Ocean separated them, but now in 1774, the conflict brewing between the British Empire and the American colonies brought them back together. What is it that keeps Phillip from remembering his childhood and how is it the key to his and Elizabeth’s love for one another? Phillip turned back to the window. “You may leave now, boy.” Gerald said to the cabin boy who still stood at the door. The boy left and Gerald closed the door. “Yes, you told me your father, now Major General Randolph adopted you and brought you back with him to England. I believe you have told me a thousand times! I can’t count the number of times you’ve reminded me since we started this trip,” Gerald rolled his eyes. “Exactly, I remember nothing at all of most of my childhood,” Phillip opened the porthole again and felt the sea spray on his face. The spray tasted salty on his lips. “Don’t you think that’s odd?" Phillip felt the cold yellow brass of the window frame in his hand; he suddenly felt queasiness in his stomach. He shook his head. Shaking his head seemed to relieve his anxiety. Phillip knew what to expect next from Gerald. Gerald was terribly predictable. “I realized you weren’t interested in them because you’re oblivious of their existence too. So tell me about this marvel of womanly flesh,” Gerald gestured with his hands for Phillip to continue. “Her name was, probably still is Elizabeth Thorton. I remember her as a cute little five-year old with pigtails. What I remember most about her was her little mouth could always put into words exactly what came into her mind. She always said what she thought.” “She impressed you and she was only five-years old?” Gerald did not sound impressed. Phillip, suddenly, did not want Gerald meeting Elizabeth. Gerald was the “adventuresome” one. He actually seemed to enjoy getting into trouble, because he always seemed to make it a point to find it wherever he was. Boston, of course, would be no different. If there was, trouble to be found, whether it was on the battlefield or in the tavern, Gerald would make sure to be in the thick of things. If the reports they received in London about Boston were true, Gerald would not be disappointed. Phillip, however, did not want Gerald causing trouble in the Mayford home, and he really did not want Gerald to meet Elizabeth because Gerald thought himself a lady’s man. Phillip, on the other hand, was a saint compared to his old friend. He avoided all kinds of trouble by always playing by the rules. He was not the kind of person to break ranks. He was more disciplined than most of King George’s officers were. “You were insensitive,” Gerald agreed. Phillip brushed his friend’s hand from his shoulder. He turned again to stare out over the waves toward the West. His destiny, he knew lay beyond those waters at the colonial city known as Boston. Now that you've enjoyed the chapter, tweet your find with your friends, Pick up a copy of the whole book.